This morning, 11/20, I birded Bunche Beach again. I was unable to find the AGPL again, but had many good birds. The highlights for me were two RED KNOTS and a juvenile LONG-BILLED CURLEW. The curlew proved to be difficult for me to ID. I expected it to be a cinch, (I’ve seen many) but the shorter than usual bill threw me. It was a juvenile bird, and Whimbrel seemed a possibility. No central white stripe on crown and no dark eye line combined with buffy unstreaked sides determined it was indeed a LBC. All of the other usual suspects were present. Today, Ed Debellevue and I birded Babcock/Webb WMA and Bunche Beach, Ft. Meyers. Good birds at BW were six BROWN-HEADED NUTHATCHS and three RED-COCKADED WOODPECKERS. 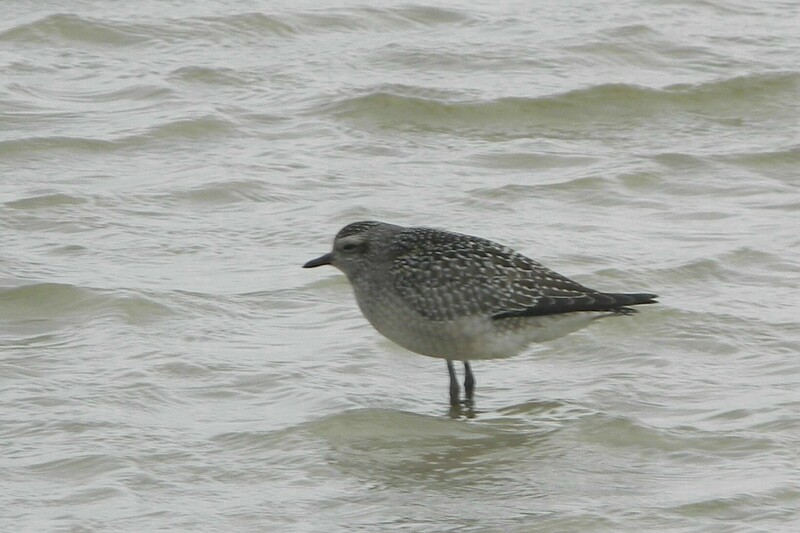 At Bunche Beach, Ed found an American Golden Plover among the Black-bellied Plovers. We had two Snowy Plovers and many Piping, Semipalmated and Wilson’s Plovers that with the two Killdeer gave us a seven plover day. On Thursday 11/17, Bill Fiero and I birded south east Florida, including Castello Hammock and Everglades NP. We had many the same birds Ed DeBellevue and I had last weekend. Besides those, we had two Vesper Sparrows on the fence near the C-111 Vermilion Flycatcher. We also found an adult winter Lesser Black-backed Gull on the sand bar at the visitor center in Flamingo. This afternoon, five Magnificent Frigatebirds soared directly overhead at the beach. Five males and one female wafted around for tweny minutes. Other nice sites included nearly 300 Black Skimmers passing as we sat on the beach. With plans for two full days of birding coming up tomorrow and Friday, I decided to spend the day 11/16, around the condo and at the beach. It was quite birdy this morning. A nice find was a family of four COMMON GROUND DOVES in the sea grass in front of the condo. This was the first I had seen them here since we came down, and they are usually always present. I guess I have to be here to see them. Also nice was a SNOWY PLOVER on the beach. I have always had all the other regular species (though piping rare) here at the condo, but this was my first Snowy. 8 Wilson’s were present as well. As I worked my way down the beach, I had my first Ring-billed and Herring Gulls of the trip, as well as the first Reddish Egret here on the beach since I arrived. Today, 11/15, I spent the day birding with Bill Fiero who is down for a week from New York. We had a good day, retracing some of my steps from the last few days. At Eagle Lakes Park a female Painted Bunting and two Limpkins were good finds. A Blue-headed Vireo was new for the trip for me. We then headed out to the flooded fields just west of Ava Maria. I found two Ruddy Ducks and three Gadwall, both new and the Lesser Scaup, several Wigeon and all of the ducks from yesterday except the Redhead. It could still be there, there are so many ducks to sift through. From there we headed to Deer Fence Canal. Enroute we found an open field with Crested Caracara, Wilson’s Snipe, Savannah Sparrow, Sandhill Crane and a Snail Kite, all new for Bill for the trip. We had an unexpected detour, and then each headed for home. Bill called to tell me he had Scissor-tailed Flycatchers at the usual spot. Great day! Since I did the big trip to the glades yesterday, I decided to stop after the ducks and head back to the condo and a day at the beach. Today, 11/13, Ed DeBellevue flew in from California. 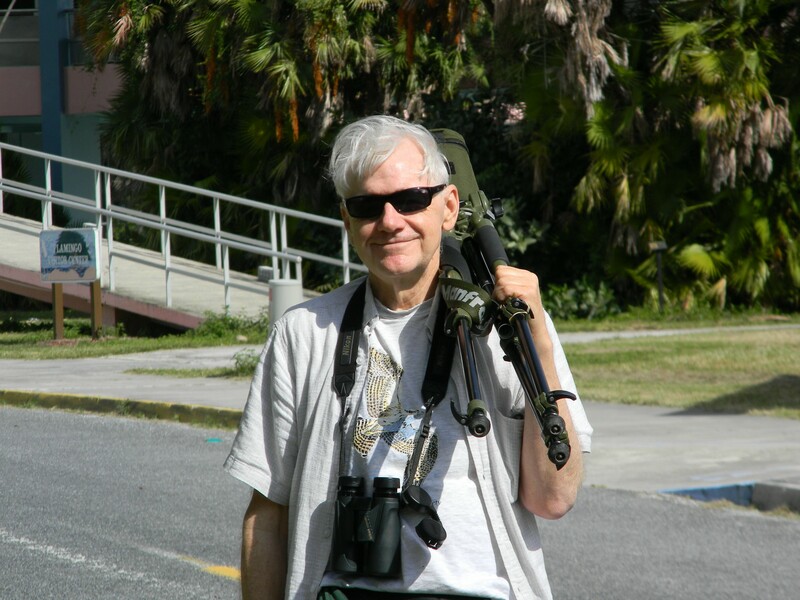 I met him at Pembroke Pines and we birded south eastern Florida, including Everglades National Park. It was a great day with many nice birds seen. I added 12 species to my trip list. Highlights were: Painted Bunting, 2 Vermilion Flycatchers, Common Ground Dove, White-winged Dove, Brown-crested Flycatcher, and Western Kingbird. We had great looks at both Swainson’s Hawk and Short-tailed Hawk. A ten foot Salt Water Crocodile was a nice find. From the Everglades, we headed back to Castellow Hammock where we found a few warblers, four Ruby-throated and one Rufous Hummingbird. It was great to see Ed again and we really enjoyed getting out there to bird. Today, 11/12/11, I birded Harnes Marsh near Leahigh Acres in Lee County. While it was not as birdy as predicted, there were many birds present. Highlights included: 12 Sandhill Cranes, 3 Snail Kites, 1 Limpkin and hundreds of American Coots. I only added one species (kite) to my trip list today. When I left the marsh at midday, I got stuck in a traffic jamb due to an accident. After nearly an hour delay, I decided to scrap my other plans for some new birds and head back to Bonita Beach. Today, 11/11/11, Eddie and I traveled to the south central part of the state, just east of Immokalee. I was in search of tyrant flycatchers and grassland birds. Though the flycatchers were scarse, we had a great morning and I added 7 new trip birds bringing the trip total to 104 thus far. Highlights today included: Crested Caracara, Scissor-tailed Flycatcher and Long-billed Dowitcher. Rts 838 and 833 were the most productive with many birds seen along both routes. A very cooperative Peregrine Falcon was a nice find as well. Today, 11/10/11 I birded Bunche Beach and Ding Darling Wildlife Refuge on Sanibel Island. I had some nice birds. Highlights included my first SNOWY PLOVER in a couple of years, Marbled Godwit, Piping Plover, Common Tern and Western Sandpiper, all at Bunche Beach. At Ding Darling, I had American White Pelicans, Roseate Spoonbill and Reddish Egret among many others. This brings my trip total to 97 species thus far. Ed VanBuren and I are on a trip to Southwest Florida. We stay at the Salty Surf on Bonita Beach, this is our 21st year here. We always come in November, and sometimes in April. It is like our own home away from home. After a long trip south, we spent some time walking the beach this afternoon. It was nice to see the White Ibis right at our feet. I couldn’t help but wonder if they were related to our summer visitors in Orange and Sullivan Counties this summer. I had a total of about 30 species the first day and enjoyed the sun and warm (82 degrees) weather. I will keep you posted. On our second day, I birder Corkscrew Sanctuary. It was quite birdy, though warbler species were few to be found. Highlights of the morning included Wood Stork, Boat-tailed Grackle, White-eyed Vireo and a mother Alligator with several babies. Upon my return to the condo, I again walked the beach. This afternoon, there were many plovers on the point up from the condo. They included Black-bellied, Semipalmated and (18) Wilson’s Plovers. The three regular species of tern, Royal, Sandwich and Forster’s were present in good numbers as well as Laughing Gulls. All this while four Magnificent Frigatebirds soared overhead. The third day, I headed to Eagle Lakes Park near Naples. This is one of my favorite spots to bird in Florida. If a person had only one day to bird, I would recommend there. I had a total of 50 species here this morning, which is down slightly due to high water (no shorebirds). Highlights included Mottled Duck, Wood Stork, Limpkin and most of the waders that could be expected. Two misses today included Bronzed Cowbird and White-winged Dove. Since I have seen no cowbirds, it may be a little early. Great day of birding! This morning, Wednesday 11/9, I birded Babcock/Webb Wildlife Management Area off rt 75 exit 158. This is another of my favorite spots to bird. It was quite birdy, though different from some Novembers. There has been an extreme amount of rain this fall, and much of the habitat was flooded. I normally always get Bobwhite and Sandhill Crane at this location and didn’t find them this time surely due to high water levels. That said, I had many of the sought after species for this location. First and foremost, I found a family of four BROWN-HEADED NUTHATCHES, and only one RED-COCKADED WOODPECKER. Though they were cooperative, high water kept me from getting close enough for good shots. A life Butterfly at this spot was a “Whirlabout” a species of skipper I had never seen before. 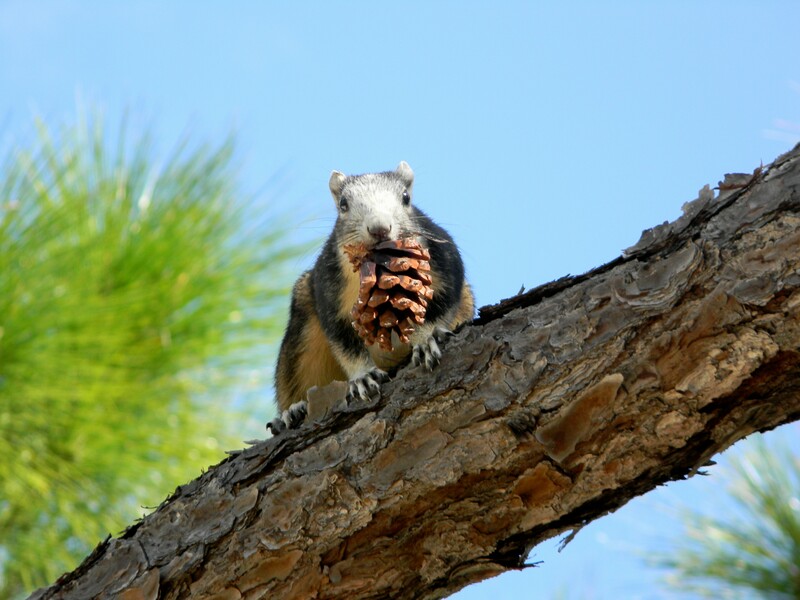 Another exciting find was a “Florida Fox Squirrel”. Though I have seen them before, they come in an array of colors. 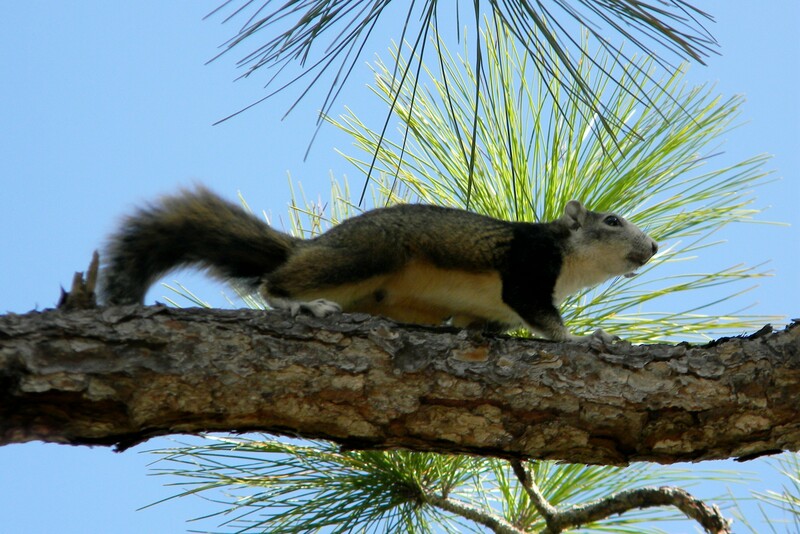 This was one of the most beautiful squirrels I have ever seen, second only to a Mexican Fox Squirrel I saw in 2006. Other birds seen today included Yellow-rumped, Pine and Palm Warblers, American Bittern and Green Heron. A total of 40 species for the site brings me to a current trip total of 85 to date. John, sounds like your having a great trip already! All is quiet up here as of now but I’m sure your aware of the flocks of redpolls and W.W. Crossbills in the adirondacks. Maybe they will be here when you get back!